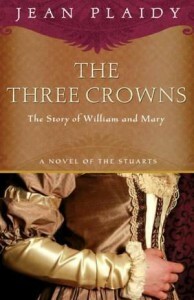 This is one of the Plaidy novels that has several mini-stories, though mostly focuses on the upbringing of Mary, daughter of the Duke of York and future Queen of England, and William of Orange. I’ve read The Queen’s Devotion (a reprint of William’s Wife) and had found it to be one of my least favorite Plaidy reads because she was not a strong protagonist. Had I known this one was mainly about her I may not have been so eager to read it. It starts out with a lot of Charles II, so if you’re a fan you will enjoy his personality and witticisms. Jemmy, the Duke of Monmouth is a main character, and one of Mary’s favorite companions. The Duke of York, of course, plays a major role, at first with his Duchess, Anne Hyde, and then the story of Mary of Modena is expanded on from her early life. One of the characters Plaidy surprised me with was a friend of William of Orange when they were children. They were thrown together with an idea of a possible future marriage (which did not end up happening). The lady turned out to be Elizabeth Charlotte of the Palatinate, who later married Louis XIV’s brother, Philippe, who had been married to Charles II’s favorite sister, Minette. I have read of her in a couple of books, so it was fun to see her as a sort of wild child in this novel. I was not looking forward to reading about Elizabeth Villiers, who was jealous and catty toward Mary from the start, because I knew she’d end up William’s mistress and I had enough of her from The Queen’s Devotion, but she wasn’t part of the main story. William’s personality was explained in much more detail and this is where Plaidy’s psychology background really shows. He is absolutely deplorable, yet you understand why he is this way. Mary, however, is a bit harder to figure out. My 21st century mind boggles at her meekness toward William; you just want to rebel for her. “The Three Crowns” refers, not to the three candidates for the throne when Charles dies as I thought, but to a prophesy at William of Orange’s birth. The candles gutted out and when the midwife held him up in the air, she saw a light over his head that looked like to her three crowns. This was interpreted as England, Scotland and Ireland.